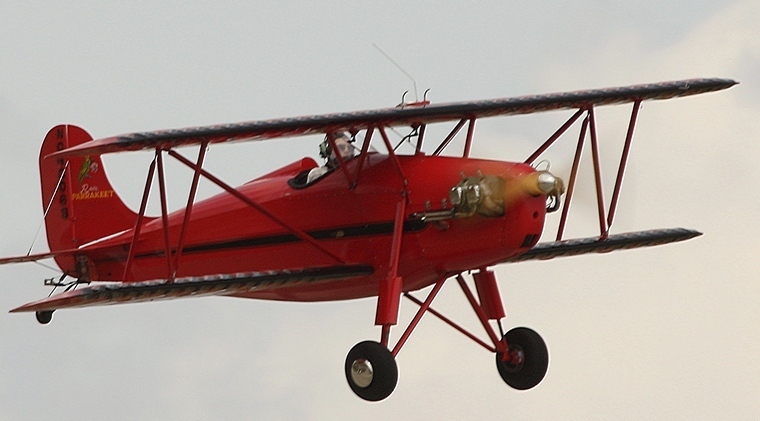 Originally designed by Jennings W. "Jack" Rose in 1929, the Rose Parrakeet is a small single seat biplane. Because of the short wing span and agile handling characteristics of the Rose Parrakeet it was often used as an aerobatic show plane by well-known air show performers. Jack was born in 1901 two years before the Wright Brothers made their first flight and in 1910 when he was nine years old he saw them flying. In 1917 whilst employed as a construction worker at Chanute Field in Illinois he was given access to the Officer's Club Library where he read up all he could on aircraft. In 1923, now 22 years old he soloed as an Army Flight Cadet in a Curtis JN-6H “Jenny” and with 13 hours was released from service and he moved to California where he saw his first homebuilt aircraft. In 1924 he obtained his flight instructors rating and bought a Curtiss Oriole in which he instructed until the following year when he joined the Barnstormers circuit that was then all the rage and much more financially rewarding than teaching others to fly. Flying the Oriel and a Hispano-Suiza powered Jenny Jack became one of the stars of the circuit, amazing tens of thousands with his daring stunts. During 1927 Jack started designing a biplane and in 1928 got his Aircraft Mechanic License and a year later in 1929 his Transport Pilot License. In 1930 he formed the Rose Aeroplane & Motor Co., Inc. and built the companies first aircraft the Parrakeet. Designed for type certification the Parrakeet prototype was originally powered by a 25 hp Heath Henderson engine that was later replaced by the 37 hp A-40 Continental and in 1935 CAA approval was received and production commenced. The single seat open cockpit Rose Parrakeet A-1 was of conventional design with a steel tube fuselage and tail surfaces and wood truss rib and spruce spar wing covered with fabric. Unlike its competitors the Parrakeet used a single strut in place of the usual flying wires to brace its staggered wings. Subsequent models were tested with Scott 40 hp, Menasco 50 hp and Franklin 50 & 60 hp engines. Model A-4 was powered by Continental A-65 & A-85 fuel injected engines. Only eight Parrakeets were built by Rose Aeroplane & Motor Co. Inc. In 1948 Jack granted the rights to produce and sell five Parrakeets per year to the Hannaford Aircraft Co. In 1950 Hannaford Aircraft Co completed and sold its first Hannaford A-4 as an experimental and Jack who had never intended for the Parrakeet to be sold as a homebuilt and had it certified contended that Hannaford was in breach of contract and sued. The matter was eventually settled out of court. In 1955 Hannaford started marketing plans for its Hannaford Bee D-1. The Bee was in fact a copy of the Parrakeet and enthusiastic home builders have been building Parrakeet replicas from Hannaford's Model D-1 plans ever since. In 1968, Doug Rhinehart obtained a licence from Jack to produce five all-new Parrakeet model A-4Cs powered by the Continental O-200 (100 hp) engine. These were type certified and manufactured by the Rhinehart Rose Manufacturing. Jack passed away in 1979. His Parrakeet still lives with eight being registered in the 1990s, one in 2002 and one in 2005. Many of the original eight, including the second one built in 1933, as well as those manufactured by Rhinehart still fly whilst numerous others were built from plans based on his design marketed by Hanneford and others. In total twenty are currently airworthy with a number being restored.